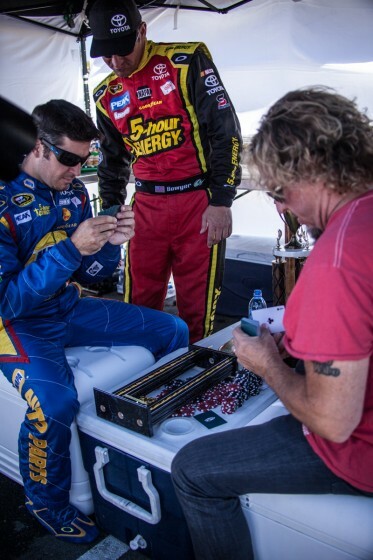 Sammy takes Martin Truex Jr. and Clint Bowyer for all they've got in some racetrack poker (for a video shoot for the upcoming album), but Martin had the big win, coming in 1st at Sonoma and his 1st victory with Michael Waltrap Racing! - congrats Martin! Great news! Thanks for sharing! If you need professional academic paper writing help, feel free to address http://buy-custom-essays.net. Best regards. Hello! Thanks for inviting me here. As I can see - this new video shoot will be awesome. It is realy nice idea - racetrack poker. Thanks for sharing it with us. I will be waiting with passion for their upcoming album. Don't forget that www.custom-paper-writing.org can write brilliant description for every new song. He got one under his sleeve watch out boys!!!!!!! !